We all know Vivo is known for the music, design and its specifications. The Chinese phone maker add new features to vivo phone as per the demand and as per the current era. What will be the storage capacity of Vivo Xplay7? Some leaked reports on gadgets 360 and Weibo suggest/hint that the upcoming phone of Vivo might have 10GB of RAM with 256GB/512GB ROM i.e. internal storage. Some Extra Ordinary Specifications of Vivo Xplay7. However, this is not officially confirmed yet. 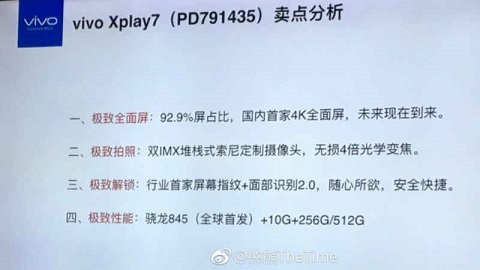 Besides RAM and ROM, Vivo Xplay7 is expected to have a 4K OLED display with a Snapdragon 845 SoC processor and an under-display fingerprint sensor. As of now, this is one of the fastest processors any phone can have. The owners of Chines phone maker had earlier launched the Vivo Xplay6, back in 2016. If the reports are believed to be true, Then we are having an amazing phone and not only that. This will force other companies to make phones with more specifications and features. Overall this will make 2018 a gadget year. Further, Vivo X20 Plus UD is the first phone which was launched with an under-display fingerprint sensor. So we can say that this can be the second phone of vivo with an under-display fingerprint sensor. Reports also hint that the Vivo Xplay7 might also be secured with the Synaptics-powered fingerprint recognition technology. What will be new in Vivo Xplay7’s Cameras? 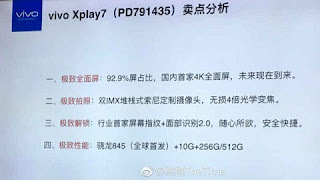 Coming to the camera, Leaks reveal that Vivo Xplay7 might have a dual camera with 4X optical zoom, Which is a good thing for camera phone lovers. What about the display of Vivo Xplay7? Further, the phone is said to have a 4K OLED display with a 92.9 percent screen-to-body ratio. Which will make it look an awesome phone with an excellent display to enjoy videos and movies. As of now, This might be the first phone with so many specifications, especially that double-digit RAM and that too of 10GB RAM. There is no update about the battery capacity and backup. Also, the price of the phone was not mentioned but as per our estimation, The phone may be available at Rs.35000-Rs.40000. Coming to the battery, The battery might be of 7000 Mah or more. This will be due to the display size and the storage capacity of the phone.